Märzen, known as Oktoberfest in its autumnal guise, is an Old World style of lager beer originating in the German state of Bavaria. Talk is cheap, so let’s have a sip — strictly for research purposes. This Märzen is orange-tinged amber, with a rich, malty aroma. There is a toasted, malty sweetness in the mouth, yielding to impeccable balance and dryness in the finish, albeit without discernable hoppiness. The body is medium, and the flavor is clean and crisp, as lager should be, with absolutely none of the fruitiness characteristic to ale. The elegant Märzen in my glass disappears all too quickly, even as it conjures totemic images of sausages, dirndls, onion-domed churches and festive maypoles. However, while my brain screams “Munich,” the growler before me calmly reads “Louisville,” as referring to our local 4th Street branch of the Gordon Biersch Brewery Restaurant network. Here in River City, Märzen is an everyday Gordon Biersch draft, brewed on site by brewer Nicholas Landers, a transplanted Cincinnatian who sharpened his skills at Lakefront Brewery in Milwaukee after attending Chicago’s Siebel Institute. Most American brewpubs of a similar capacity (circa 700 barrels per annum) do not specialize in lager styles, which take longer to brew than ale. However, Gordon Biersch, named for founders Dan Gordon and Dean Biersch, has always been something different. Befitting Gordon’s brewing studies at the prestigious Technical University of Munich, a core of lager styles from the German, Czech and Central European pantheon has comprised Gordon Biersch’s niche since its 1988 inception in Palo Alto, California. These include Märzen, Export, Pilsner, Dunkel and Maibock, all brewed according to the Reinheitsgebot (beer purity law), and all familiar to anyone who has traveled in Bavaria or dined stateside at a good German restaurant like Louisville’s Gasthaus. In recent times, brewers like Landers at Gordon Biersch’s 34 company-owned locations have con­si­derably more freedom than before to create seasonal and one-off ale styles, providing guests with counter­point to the lagers and “guest” beers already on tap. “We’re holding to tradition with our lagers, but being able to do India Pale Ales now is awesome,’’ Landers says, noting that in addition to his house lagers and certain contrarian German ales (Hefeweizen and Kölsch), he’s also been crafting limited editions of Porter, Stout and even a few Belgian styles. However, here we must pause, because an important question needs to be addressed. What is the difference between ale and lager? It’s fundamental, and the legendary Fred Eckhardt, dean of American beer writers, offers a deceptively simple answer. Ale and lager are both beers; that is, they are fermented from grain. The major difference between these two beer families stems from the temperature at which fermentation is carried out. And the importance of these differences in tem­perature is that chemical reactions happen more slowly at lower temperatures. From the very beginning, mankind has harnessed the natural process of fer­men­ta­tion to produce alcoholic beverages, using grains, grapes, fruits, vegetables and honey. Eons of experience abundantly illustrate that when humans mix water, sugar and yeast in stray bowls or pottery, it takes little time before fermentation gets underway. However, the story of ale and lager is one of contrasting brewing methodologies, and it is a specifically Eurocentric tale, evolving comparatively recently with the march of science. Beginning in medieval times, brewers in Central Europe learned through trial and error that cooler fermentation tem­pera­tures and lengthier aging (the word “lager” in German means “to store”) made for a crisper, cleaner and mellower end product. But why? They couldn’t possibly know until the invention of the microscope, which provided the means to view the activity of yeast, the living micro-organism that diligently converts sugars into alcohol. Once yeast’s role was unmasked, science quickly began deciphering fermentation’s perennial mysteries, and by the 1830s lager yeast had been isolated and began coming into common use. Lager brewing’s cooler fermentation temperatures slow chemical reactions, and by doing so, substantially reduced flavor and aroma by-products. Conversely, at warmer fermentation temperatures, these flavors and aroma by-products are purposefully enhanced, and remain cherished components of ale’s “fruity” charm. Like the Beatles much later, lager brewing blossomed at just the right time. By the late 19th century, lager was an international sensation, perfectly suited to burgeoning consumer cultures, industrial economies of scale and a zeal for scientific advancement. Lager consciousness swept the world, and ale was pushed into localized (and stubborn) corners like Great Britain and Belgium. Inevitably, lager became too perfect. Crisp, clean and mellow yielded to cynical mass-market flavorlessness, which inspired the American craft beer backlash of the present era. In 1988, Dan Gordon saw the issue from a different angle. To the Bavarian-trained Gordon, lager wasn’t something to be overthrown and excluded. Rather, lager needed reclaiming and rehabilitation. He would emphasize the flavorful origins of classic lager styles, and localize their production as his new company grew. Consequently, unlike some other national brewery concepts, Gordon Biersch house beers are brewed right here in Louisville, where chain or not, the company helped launch the Kentucky Guild of Brewers, working alongside the state’s independent small brewers. 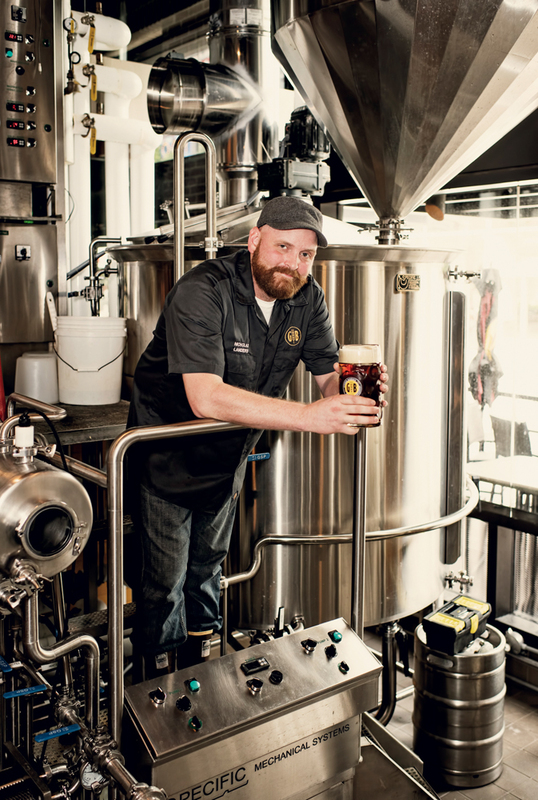 Jason Smith is Gordon Biersch’s general manager, and when asked to specify the single most important aspect of his work, he does not hesitate. “Commitment,” Smith replies, and then elaborates. Chain skeptics, of whom the author is one, might yet scoff; after all, 4th Street Live lies at Gordon Biersch’s front door. However, the prevailing evidence illustrates that ample localism is being served alongside the beer and food, owing to the daily commitment of the people working for Gordon Biersch.